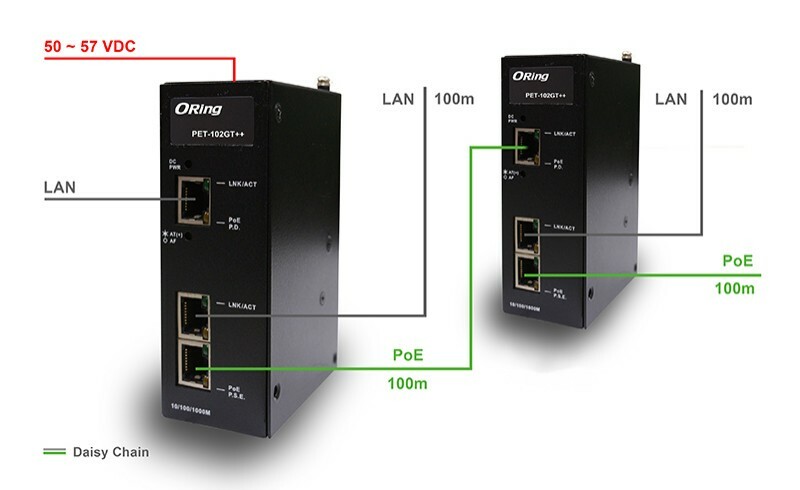 Power-over-Ethernet (PoE) is being used in the industrial field for the connection of IP cameras, PoE-enabled sensors or HMI-devices. These devices, however, are often 200 to 300m away from the next central switch. In order to supply these devices with PoE, the new Gigabit PoE extender PET-102GT++ from ICP Deutschland comes in place. Long distances (up to 600m) can easily be bridged with no additional power supply. The combined Ethernet data transmission and current feed is enabled via one 10/100/1000Base-T(X) PoE Powered Device (P.D.) input and two 10/100/1000Base-T(X) PoE Power Source Equipment (P.S.E) outputs. By means of the integrated Daisy Chain function several PoE extender can be connected in series with the respective P.D. device over a range of 600m. In addition, the PET-102GT++ provides a so called “High Power” function. This enables the operation of performance intensive LTPoE++ P.D. devices with up to 90W per port. Thus, the conventional usable output 12.95W/25,5W, according to IEEE 802.af/at compliance, can be sextupled or tripled. The input voltage of 50~57VDC, the operating temperature between -20°C~+ 70°C and the DIN rail and wall mounting complement the PET-102GT++. Hence, ICP offers an industrial solution that is most suitable for difficult to access areas such as factory buildings or traffic control systems.